For use in signal distribution systems to split the amplified signal to up to 4 antennas with minimal signal loss. Weatherproof case for indoor or outdoor use. Our standard units are offered with N/Female connectors and are capable of handling 10W of power into a matched load. These units are ideal for in-building applications that require the combining or dividing of RF to accommodate multiple antenna locations. 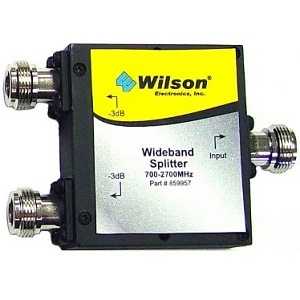 This 2-way splitter allows you to drive two interior antennas from a single amplifier/repeater. Because you are splitting the signal each antenna will receive approximately 1/2 of the signal which equates to about 70% of the coverage distance when compared to driving a single antenna. 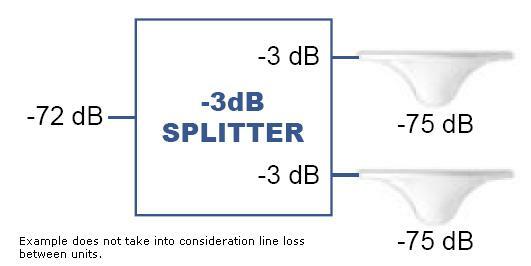 Connecting splitter to amplifier: Typically the splitter is connected to the amplifier using the 2' LMR-400 coax extension but any length of LMR-400 cable may be used. Other Wilson Electronics antennas may be connected directly to the splitter using either the N/Male to FME/Male adapter or using a length of LMR-400 cable. Allows you to drive two interior antennas with a single amplifier/repeater. Supports 800Mhz to 2500MHz. Allows you to drive three interior antennas with a single amplifier/repeater. Supports 700Mhz to 2700MHz. Allows you to drive four interior antennas with a single amplifier/repeater. Supports 800Mhz to 2500MHz.